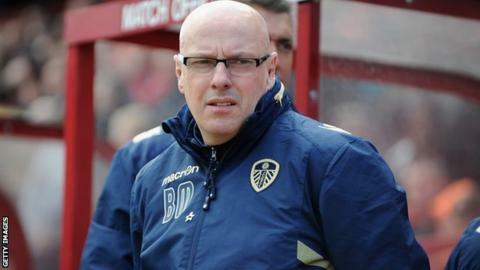 Leeds United owner Massimo Cellino has said that previous owners GFH were "not straight" with manager Brian McDermott when he was appointed. The former Reading boss was brought in to replace Neil Warnock last April and he helped keep the club in the Championship last season. Cellino intends to meet with McDermott this week to discuss future plans. "They should have said to him that there is no money because he is not a magician," he told BBC Sport. "It was all wrong the way that he came here. They were not straight with him. "They forced him to be somebody that he wasn't and that he never wanted to become." But the Italian said: "I have to treat him with respect because he is a nice man and a good coach and has tried to do the job. "We have to talk but we have much bigger problems than his future." Cellino plans to bring in former Sheffield Wednesday, Aston Villa and Bradford City forward Benito Carbone to work with the club's academy. "We have a lot of things to do and we need to start from the bottom again with the academy," he said. "Benito will rebuild the academy with my help. I will not accept the philosophies they have there at the moment because I don't like them - people must accept my conditions." Cellino, 57, who completed his protracted takeover of Leeds earlier this month, believes the Elland Road club can be back in the Premier League in 2016. They were relegated from the top flight in 2004 and have not returned since. "We have to fix the club's illness and then after that we can focus on going up," he concluded. "My plan is to spend the next months getting the club healthy and then the next season we can go up. "The club must be healthy again before we can be promoted. People before were throwing money out of the window and just hoping to get to the Premier League to save the club's finances." Leeds, 15th in the Championship, finish their season with a home match against promotion hopefuls Derby County on Saturday.